We all feel so blessed and lucky whenever we survive a deadly accident. You are gracious for your life and thank the almighty, isn’t it? You might have seen many deadly accidents but this one is terrifying which was caught live on the CCTV camera. A car flipped and crashed into two against the fence. The incident took place in Mandy White of Benfleet, UK on may 17. A woman was taking her children to school. Suddenly, a car ran towards them at high speed from the opposite side. The driver of the car was hit by an oncoming car and lost the control. The car eventually turned, mounted the pavement and rammed into the family. 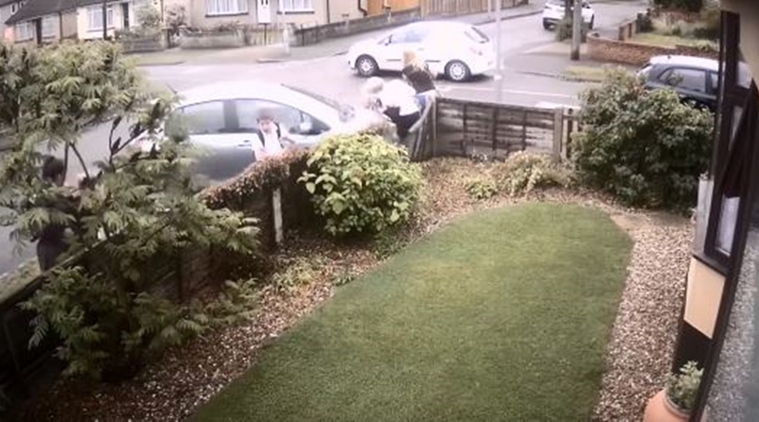 The car drove straight into the family of three, pinning them against a fence. In this video, screams, and shouts of victims for ‘help’ can be heard clearly and then you can see the mother being helped up by onlookers. Miraculously, the mother and her two children survived the horrific car accident and the driver also escaped unhurt. According to the reports, the 42-year-old mother was accompanied by her daughter Poppy, 5, and 17-months-old Taylor. “I don’t remember how we got out,” Ms. White said. 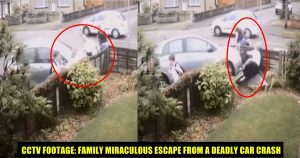 If you don’t believe in miracles, this shocking video might just change your mind. The traumatized mother said her family is “lucky to be alive” after being pinned against a fence by a car in this terrible incident.